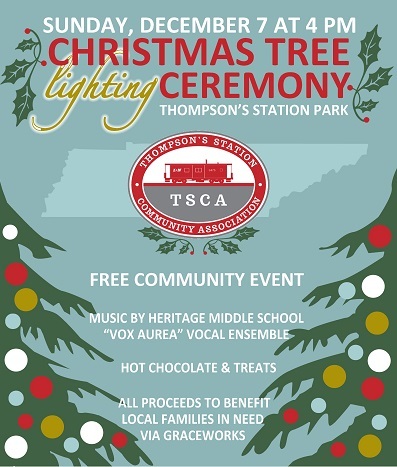 The Thompson’s Station Community Association (TSCA) will host a Christmas Tree Lighting Ceremony on Sunday, December 7th in Thompson’s Station Park. This free community event begins at 4:00 p.m. and will include traditional Christmas music performed by Heritage Middle School’s “Vox Aurea” Vocal Ensemble, complimentary hot chocolate and treats, and commemorative gift sales—all proceeds from which will benefit local families in need through GraceWorks Ministries. A permanent 18-foot evergreen tree donated by Dale Holmes of Brentwood Tree Farm was planted in the park earlier this year. It will be fully decorated with festival holiday ornaments, including ornaments created by art students from local schools and bows crafted by senior citizens from the Life After Fifty group. The program begins at 4:00 p.m. and will include some musical entertainment and opening remarks prior to the lighting. The TSCA will have commemorative merchandise for sale, including collectible holiday ornaments. All funds raised will be donated to GraceWorks to help Thompson’s Station families in need. The Thompson’s Station Community Association (TSCA) is a nonprofit organization dedicated to preserving and enhancing the quality of life for area residents. Officially incorporated in 1992, the TSCA has supported decades of various park improvements, community events, the reconstruction of the old depot building and the restoration of the landmark red caboose at Town Center. TSCA membership is open to anyone who resides in the Thompson’s Station area or has an interest in the local community. For more information about this event or to join the TSCA, visit www.TheTSCA.org.